Today I am sharing the recipe of Pazhutha manga curry / Mambazha curry / Kerala ripe mango curry. 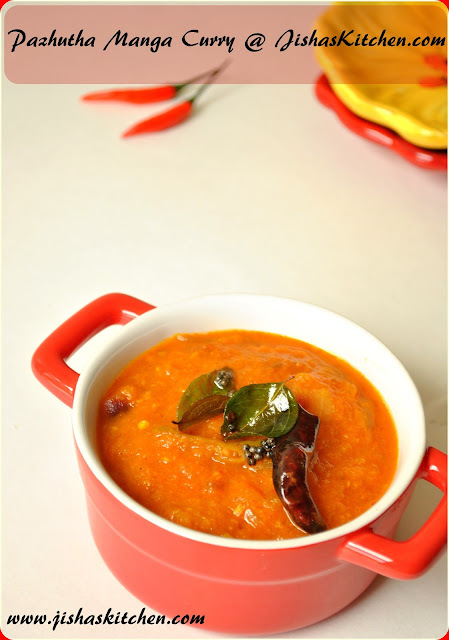 I got this recipe from my mom and its an easy and delicious curry and goes very well with rice. Ripe Mango / Pazhutha manga ~ 1 large sized / 2 small sized mangoes. 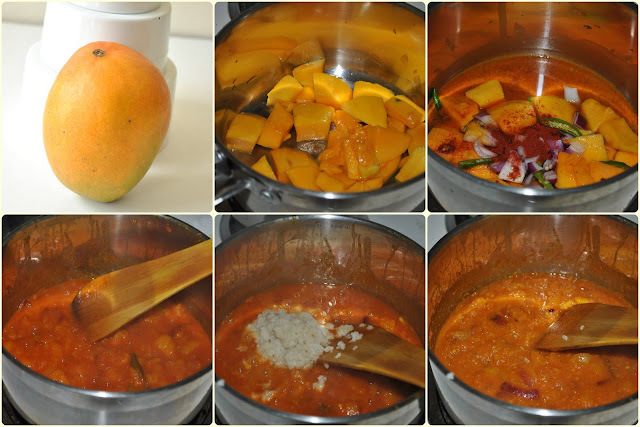 First wash the mangoes and then using a knife or a peeler, peel the skin of the mango and then chop it to medium size pieces.Grind grated coconut, cumin seeds and garlic to a fine paste by adding 3-4 tbsp of water and keep it aside. Next add chopped onions, green chillies, curry leaves, kashmiri chilly powder, turmeric powder, salt and sugar to the chopped mangoes. Then cook covered in medium low flame by adding 1 cup of water for about 20 minutes. Make sure to stir in between in order to avoid the mangoes from sticking to the bottom of the pan and while stirring if you feel the water is not enough, then you can add around 1/4-1/2 cup more water. 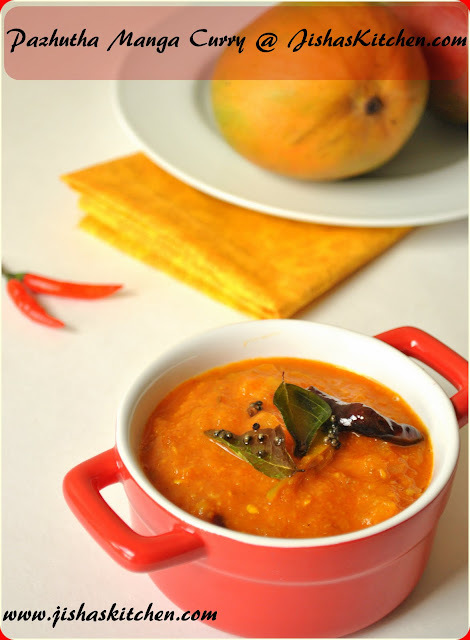 When the mangoes are nicely cooked, add the ground coconut paste to it and mix it nicely. 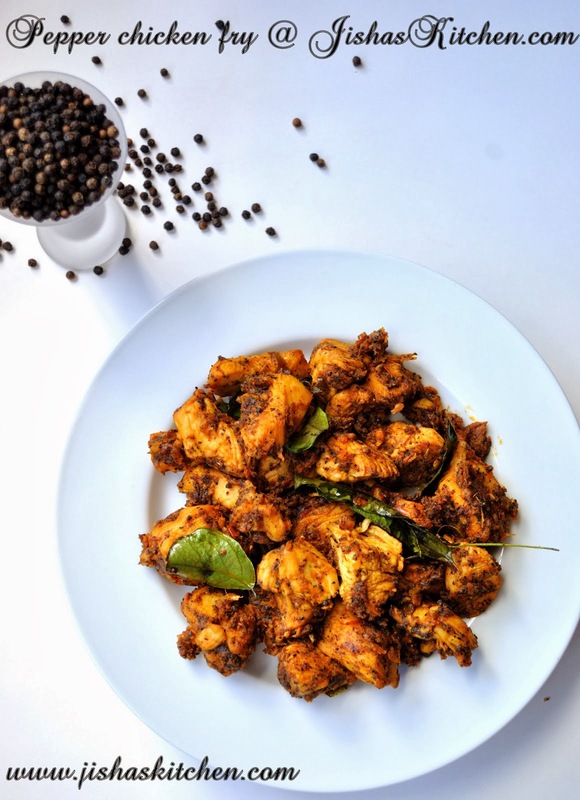 Then remove from the flame after 2-3 minutes.At last heat little oil in an another pan and add mustard seeds, when it splutter, add dry red chillies, curry leaves & fenugreek powder and fry for couple of seconds and pour this to the mango curry. This is new to me. Looking great. Amazing pic. 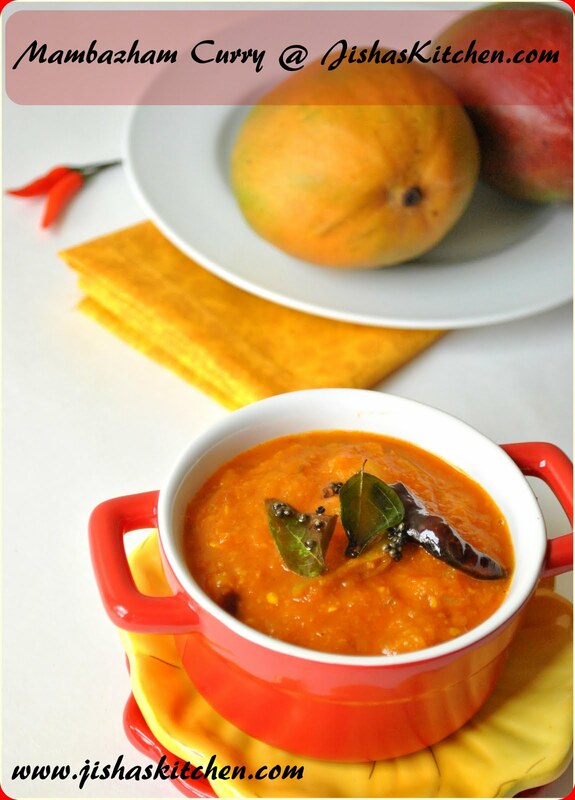 Lovely looking mango curry. Already drooling just by looking at it. 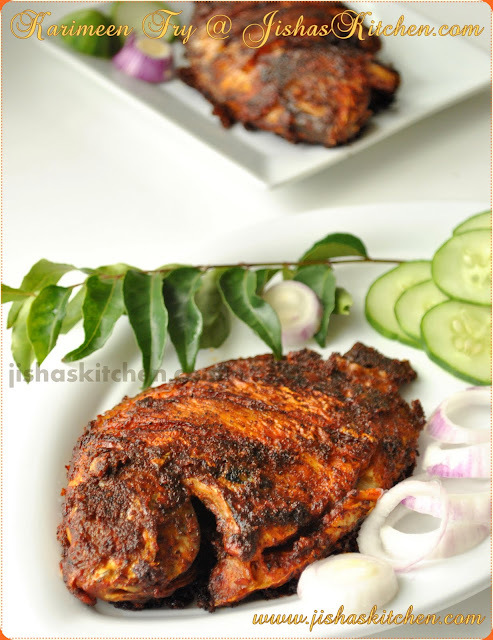 Jisha,stunning curry ketto.Why the pictures this time gone lill blurred ? Your pictures always talk. wow so awesome i shd try it am left with few mangoes..
OMg, wat a catchy,fingerlicking and lipsmacking curry,seriously feel like having some curry rite now.. I totally love ur version of manga curry!!! Looks sweet n tangy with a hint of spice!! lovely sunny curry. looks delicious. Iam drooling here. Superb! Loved the presentation too Jisha..
wow nice and interesting curry ! !